This cabinet is constructed to house our smaller tray format and is fitted with 14 trays. 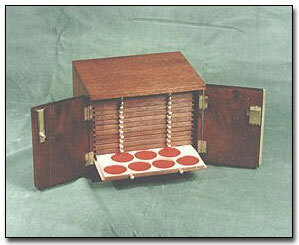 The compact dimensions and versatile range of coin recesses make this cabinet popular with the specialist collector. General specifications for the case and trays are identical to The Pheon, each cabinet uses the same selected timber, brass fittings and finishes, dimensions and numbers of coins stored being the only difference. The maximum capacity of The Mascle is 390 coins.